1. My main objective is to reuse or recycle items into something functional or fun. I need to stay true to that no matter what I decide to make. 2. Although the coffee cozies are by far my best selling item, I am not going to limit myself to that. I am going to go with the flow and see where it takes me. 3. I am going to keep one blog. Who am I kidding? I have a hard enough time keeping up with one. Two would be impossible. 4. I am still working on branding, labeling, and updating the look of my blog and Etsy shop. I was on a roll last week and haven't had a chance to work on it since then. I thought I would show you so of my various works in progress. Maybe one day I will finish them. 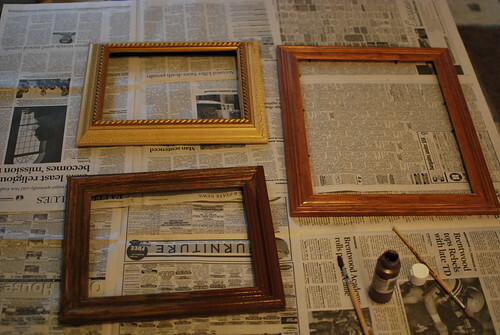 A refurbished frame/corkboard project for our craft area. 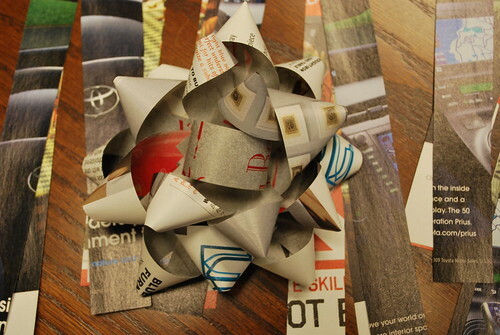 Bows made from magazines. I have a tutorial I need to put together. 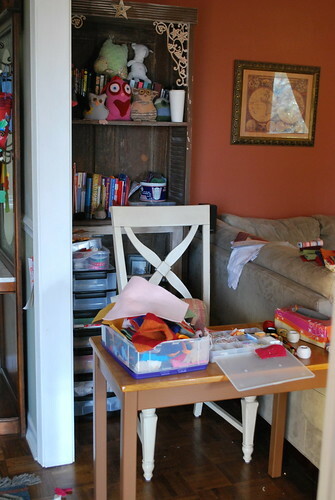 My little crafting nook. It is strategically placed so that I can watch TV while I am handsewing. See the faceless owl and sock dog? I also have a hamster like creature I made several months ago. He's the one next to Pinky. Disregard the messiness. I am a very messy crafter. 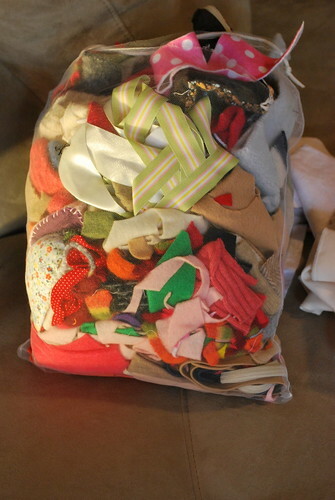 Here is one of two bags of scraps I need to go through. There is all kinds of stuff in there that I can use I am sure. 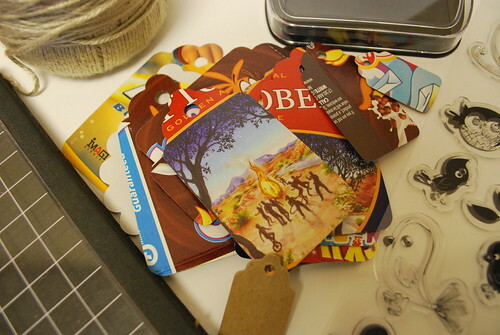 My latest obsession- making tags from cereal boxes or other various cardboard boxes. I am still trying to come up with a cute ornament/gift card holder. Here's my latest model. I am hoping now I will actually get some of these completed so that I can show you the finished product. A girl can hope, right? I'm so glad you are moving forward, how exciting!! You make such cool stuff Jen....those tags are too cool and the ornament/gift card holder is so stinkin cute!! suhweet. i'm glad you are a messy crafter, too. i like having a nice, neat space to start out with...but it always looks like a hurricane blew through by the time i'm done. i'm hopeless. i LOVE the bow - thanks so much for the tutorial, i can't wait to try it. i hate those tacky "christmas" bows, too. i have so much scrap paper as well...and construction paper bits from crafts...this could be very handy. and something i can do when i watch tv. :-) always thinking of the multi-tasking! and are you going to give your poor owl a face? or are you just waiting til the perfect inspiration? i'm sure he'll be adorable when you do get to him. more time...if we only had more time. My goodness, you sure do have a lot of projects going all at once! Wow, I'm imrpessed by your productivity. I agree...I can't hardly keep up with my blogs. Don't spread yourself too thin. Nice to know I'm not the only one that has several things going on at once! 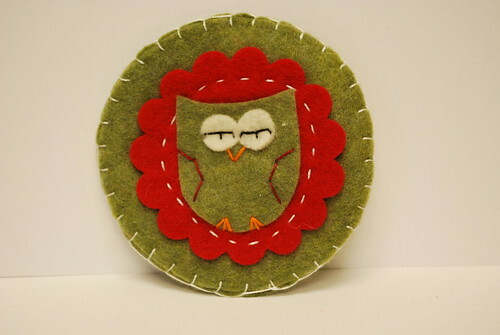 Love the little owl ornament. So cute! Is It Already Crafty Tuesday?